Many thanks to LadyMissB20 for finding this gem of a news story. 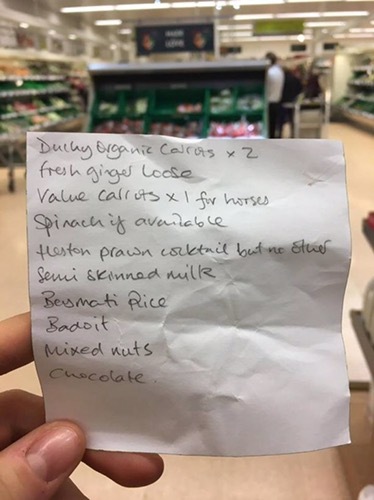 Here is the shopping list. You’re back, and with a most special (and specific) list. So many carrots – perhaps a Gujarati carrot salad to go with a curry. Plus carrots for horses (and perhaps rabbits). List written for spouse perhaps? – Heston’s “but no other”. definitely written for a spouse, giving specific brands and instructions. Love that the humans get the Duchy original carrots and the horses get value, even if that is Waitrose value!